It’s called Mosi-oa-Tunya – the Smoke that Thunders – in the local language. And for good reason: in full flow, Victoria Falls sends the Zambezi River crashing into an abyss, its plume of spray visible from 30 miles away. 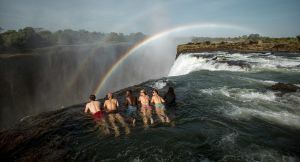 Victoria Falls Zambia lies at the heart of the southern Africa safari experience. 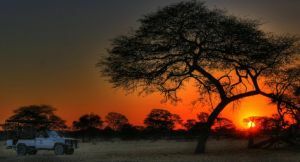 It makes the grand finale to a safari in Botswana, Namibia, South Africa and of course in Zambia itself, home to two of the region’s best game reserves – the South Luangwa and Lower Zambezi National Parks. 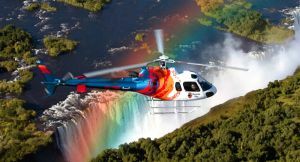 Easy to access by road or air, Victoria Falls Zambia delivers some of Africa’s biggest and most diverse adventures. 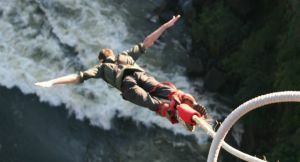 It is home to the world’s best one-day white-water rafting as well as bungee jumping and canoe safaris. 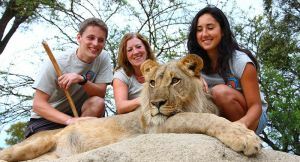 You can go on 4X4 game drives, track endangered white rhino, and walk with friendly lion cubs. Several lodges give you the chance to visit local villages and contribute to their community projects too. Victoria Falls Zambia is characterised by accommodation set on the banks of the Zambezi. The nearest town and airport – Livingstone – is 30-minute drive away. Some lodges sit within walking distance to the falls; other lodges are a 20-minute drive. It’s on the Zambian side of the river that you’ll find arguably the best honeymoon lodges and private villas as well as great family accommodation. 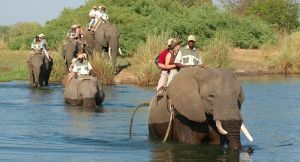 Travellers should note that the Zambezi River is the border between Zimbabwe and Zambia; Victoria Falls is thus ‘shared’ between the two countries. The views of Victoria Falls from the Zambia side are dominated by the Main Falls which dries up almost entirely in the late dry season. Visitors can however access both the bottom of the gorge and infamous Devil’s Pool from the Zambian side. Activities are available on both sides of the river and it’s easy to get from one country to the other via the famous bridge that connects the two sides. 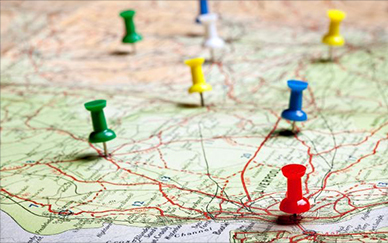 Buy the excellent-value Univisa and you can cross the border as often as you like. Victoria Falls close up is an awe-inspiring sight & the Zambian side showcases the full power of the raging Zambezi. Ask us about getting the best views for the time of year. 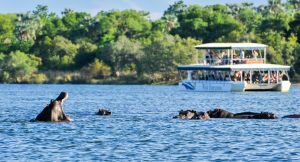 A boat cruise offers a different side to the Zambezi River: wildlife, bird watching and unspoilt scenery finished off with sunset & drinks. Leaping off the railway bridge that spans the river sends you 100 metres down into the Batoka Gorge: it’s one of the world’s Must-Do’s for adrenalin junkies. 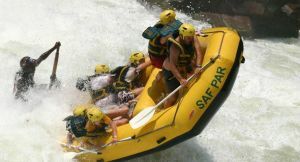 Visit Victoria Falls Zambia between August & December for the best one-day rafting in the world. You’ll ride a series of rapids, half of which are top-of-the-range Grade 5, on an unforgettable day. 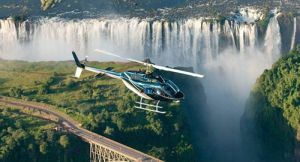 Enjoy stunning views of Victoria Falls during a helicopter safari as well as bird’s eye game viewing: you’ll be on the lookout for hippos & elephants as you fly upstream. Enjoy the biggest wildlife encounters possible at a local elephant sanctuary: you’ll feed orphaned babies, pose for photographs with them & then go on safari on top of a friendly adult. Habituated lion cubs are your playful & sometimes mischievous companions during your guided walk through a private reserve; it’s the ultimate experience for cat-lovers! We’ll design a African Holiday around you, to match your interests & budget!